EXTRA ENERGY. NO SUGAR. This is not a low-calorie food. Not at all. 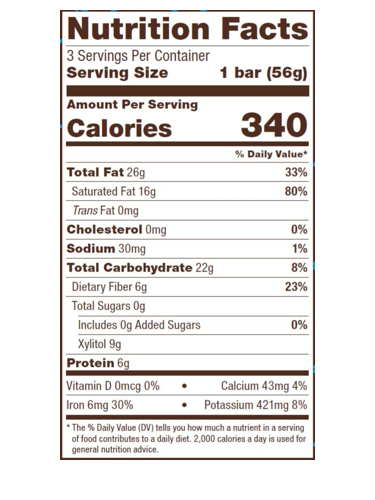 In fact, this chocolate has extra calories. It is boosted with Bulletproof XCT oil extracted from the most potent parts of the coconut for satisfying energy. Sweet! Organic raw cacao powder, organic raw cacao butter, xylitol (non-GMO from North American hardwood), Bulletproof XCT oil powder (caprylic and capric acid triglycerides from highly refined coconut and/or palm kernel oil,tapioca dextrin, tapioca), lab-tested vanilla beans, Himalayan sea salt.